Some scientific research suggests that microbes make be important in cloud formation and precipitation. During the Matza Aletsch residency on the glaciers of the Swiss Alps, I collected and sang to air-born microbes as our cellular forebears, or ancestors. 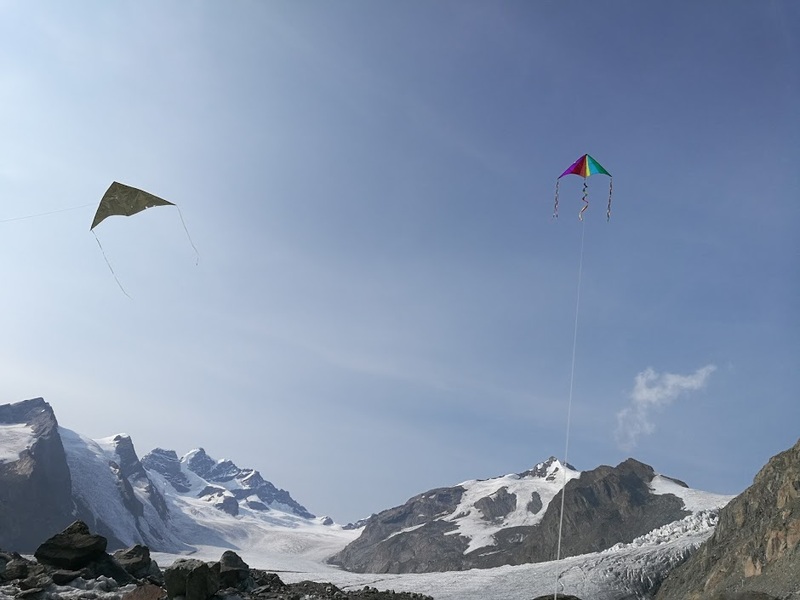 To connect with this aerial realm, I made three kites, or Drachen (meaning both kite and Dragon in German), one in white paper, one in rainbow colored nylon, and one in gold and silver mylar emergency blanket. I equipped kites with sticky pads for capturing microbes in the air, and the rainbow kite carried a spy camera. The local people of the Valais also described the Aletsch Glacier as a great dragon, or Drachen, that once threatened to consume the forests and towns below by growing during the early half of the 19th century, and that since the late 19th century has been retreating at an alarmingly fast rate (it has lost 200 meters in thickness and has receded 3000 meters). I gathered samples from the flights of my three Drachen (Kites) and examined them on the spot using a small optical microscope, under x300 and x750 magnification. After one kite collection, on a cloudy day, blueish aeolian microbes hovered under the eyepiece. I presented the Drachen and the samples I collected as part of our Matza Aletsch Vernissage, in the Konkordiahütte where the other residents and I were staying while we visited the Glaciers. Throughout the residency I collected various samples from the ice, including a black substance that seemed to be a combination of local dust and pollution, which revealed some small quartz-like crystals under the microscope. Pools of water contained minimal life, some biofilms that seemed to harbor types of algae. I also found some types of fungi on the ice, which seemed to be displaced from elsewhere but not living on the ice. Overall, the glacier itself is a living, breathing, presence, with flowing rivers that raged on sunny days forming the vasculature of its circulatory system. It is also a harsh environment for most life, so when we spotted a bird, a butterfly, and a bee traversing the vast open expanse of the glacier valley, we were surprised. Eventual genetic tests on samples from the glacier might reveal more about the microbes from the air, water, and dust samples. Maybe in the near future we can work more directly with the ice-nucelating bacteria in the air to help rebuild the glaciers. They are our kin, ancestors, after all. May all life survive, may all life thrive!